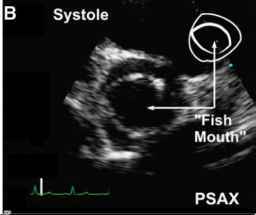 acquired in the apical five-chamber, right parasternal long axis, or suprasternal views to obtain the highest velocities across the valve. 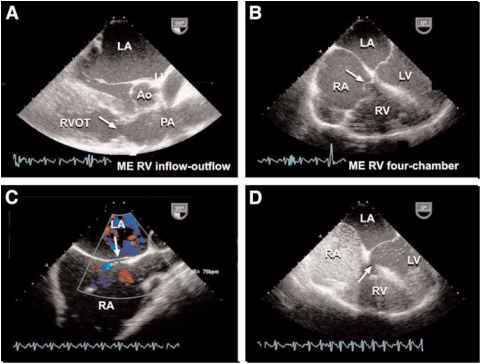 The maximum velocity obtained is highly dependent on accurate transducer positioning, and will be underestimated when Doppler beam angle deviates from that of blood flowing through the stenotic valve (Fig. 8). A nonimaging probe can be used if inadequate envelopes are found with the duplex imaging transducer. In most cases, the modified Bernoulli equation is an accurate and simple measure of the peak instantaneous transaortic pressure gradient. Peak transaortic gradient measured by Doppler should be differentiated from the peak-to-peak gradient obtained at cardiac catheterization. Hemodynamically, the peak-to-peak gradient measures the difference between the peak left ventricular pressure and the peak aortic pressure—which are not measured simultaneously. Therefore, peak-to-peak gradients are not physiological, and no Doppler measurement exactly corresponds to this measurement in the cathetherization laboratory. 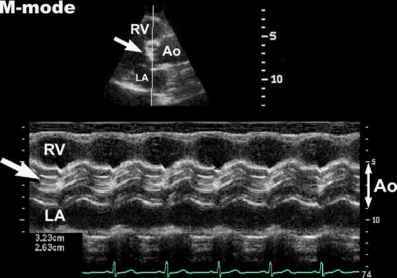 However, mean gradients across the aortic valve are similar when measured by Doppler and by cardiac catheterization. Fig. 7. M-mode through aortic valve showing characteristic thickening of valve leaflets in aortic stenosis (compare Chapter 3, Fig. 14A).